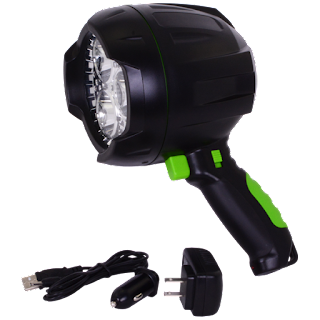 1 - Winner Holiday Contest and Sweeps recently had the honor to review the Q-BeamPerformance Night Vision 682 Rechargeable Spotlight from Viatek ConsumerProducts. This amazing Spotlight is second to none when it come to performance. This amazing Spotlight can light 4 football fields if they were lined up end to end. That's 470 yards (120 yards per field) with a battery life when fully charged of 5 hours from it's Internal Rechargeable Lithium Battery System. The 682 is also a high quality Night Vision Spotlight leaving nothing that it can't light. It comes with two types of chargers. 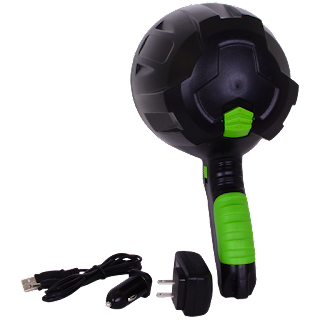 A 110 V AC Charger and a 12V DC Automotive Auxiliary Power Adapter which are both included. It's ABS Plastic Housing is rugged enough to last any inclement weather that it could be put up against. This terrific spotlight is impact resistant to one meter and water resistant IP64 rated spray. With it's 1 x Cree XML LED - 682 Lumens this is a Spotlight that should be in every household.